Escalation is inevitable. The situation in the combat zone is quickly deteriorating. According to the OSCE forecast, the situation in Donbas will inevitably keep escalating, as the sides are ignoring the call to stop the violence. “The facts are clear. The sides have not withdrawn weapons. We (…) see them every day. The sides have not de-mined. We see mines every day. (…) The sides have not disengaged forces or hardware. We see them in close proximity all along the contact line,” said Principal Deputy Chief Monitor of the OSCE Special Monitoring Mission to Ukraine Alexander Hug. On October 24 OSCE registered over 300 explosions in Donetsk and Luhansk regions. Militants keep impeding the OSCE activities. On October 25, OSCE reported that the mission’s unmanned aerial vehicle was shot at in the occupied Donetsk. Ukraine is one of the most mined areas in the world. Eastern Ukraine is rapidly becoming one of the most mined areas in the world. The information was released by the UN Assistant Secretary-General for Humanitarian Affairs and Deputy Emergency Relief Coordinator Ursula Mueller. To remind, two million hectares of land in the government-control part of Donbas remain mined. 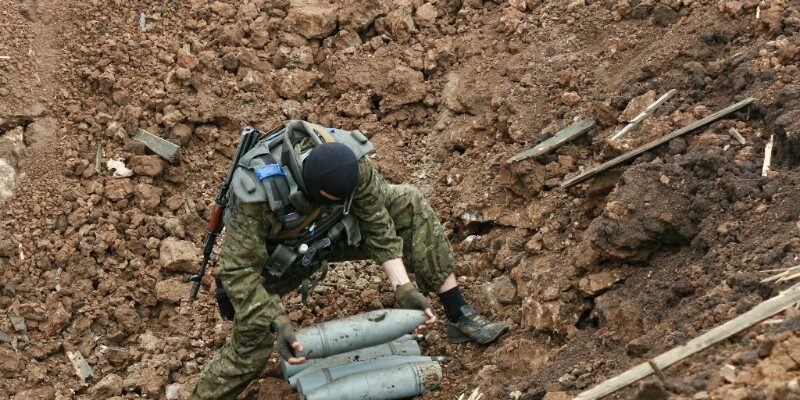 Earlier, OSCE reported that this year 27 persons had been killed, 62 more had been wounded by mine explosions and unexploded ordnance. Civilians in danger. 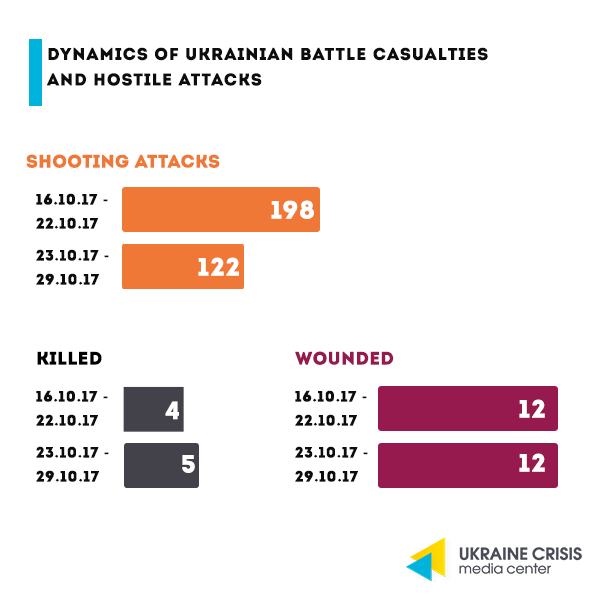 On October 28, Russia-backed militants mortared the outskirts of Vodiane town that is located near Mariupol damaging the houses of civilians. 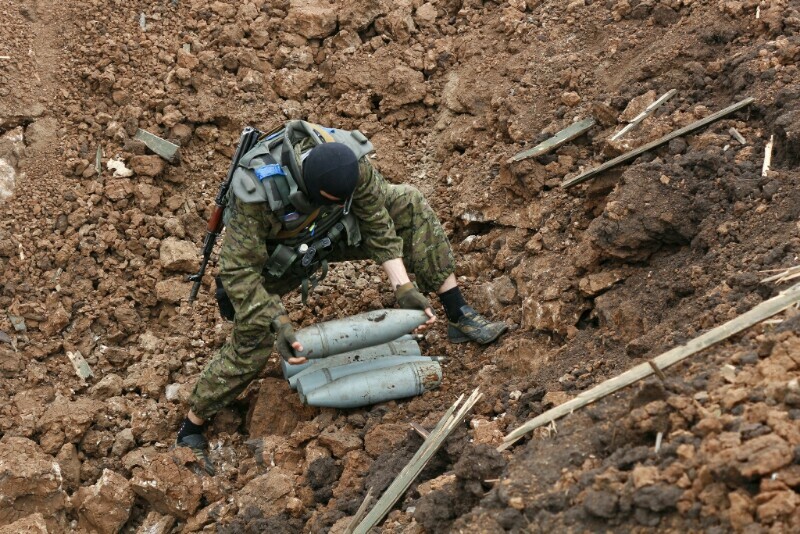 On October 27, residential houses in Shyrokyne came under the hostile fire of 120-mm mortars. “DPR” seizes accommodation if owners are absent for 6-12 months. “DPR” may be depriving of the right to property persons who do not have grounded reasons for absence, said representative of the “supreme court” of the “DPR” Lilia Reznikova. According to Reznikova, accommodation can be seized from a person if he/she is away from it for six months without solid reasons. The “regulation” concerns the accommodation that is state- or municipally-owned, same applies to the privately-owned accommodation after one year of absence. Almost 800 convicted persons want to leave the uncontrolled Donbas. Starting from 2015, 166 convicted and arrested persons in the “DPR”-controlled area have been moved to the government-controlled area. The persons in question are the ones convicted of the crimes committed before the start of the war in Donbas in 2014. Currently, 798 more convicts have expressed their will to be moved to the government-controlled areas, said representative of the Secretariat of the Parliamentary Envoy on human rights Halyna Kylymova. She added that in the uncontrolled part of the territory in Donetsk and Luhansk regions there are 27 penal institutions with about 12,700 persons confined. Last week, the Eastern Partnership Business Forum took place in Tallinn, Estonia. It is right there that it became clear that the idea of the new “Marshall Plan” for Ukraine lobbied by some of the country’s supporters, Lithuania in particular, was not supported by Brussels. What is the Marshall Plan for Ukraine? The possibility to have the Marshall Plan for Ukraine approved was voiced for the first time in spring 2017. Former Prime Minister of Lithuania Andrius Kubilius became the mastermind behind the initiative as well as its main lobbyist. At first, he even succeeded to have this project approved at the summit of the European People’s Party. The plan foresaw annual assistance to Ukraine from the EU in the amount of EUR 5 billion. Lithuania had serious hopes for the Eastern Partnership summit that will take place in Brussels in November. They were planning to officially present the plan to the heads of all the EU member states and governments, they were also counting on the fact that the document will be mentioned in the summit’s final declaration. It would give the official status to the Marshall Plan for Ukraine. What happened in Tallinn? Commissioner Johannes Hahn responsible for European Neighborhood Policy and Enlargement Negotiations confirmed that the European Commission had received Lithuania’s proposals as to the new “Marshall Plan”. At the same time, Hahn emphasized that the European Commission has doubts as to the idea, as in his opinion Brussels already has enough instruments to help Ukraine. Earlier the Commissioner made a statement that Ukraine already has a lot of assistance programs and the new one is not going to change anything. “We have committed to providing EUR 12,8 billion for holding the reforms. Not to mention the financing offered to Ukraine by other donors and international organizations. In a way, the Marshall Plan for Ukraine is already in force,” the Commissioner told Eastbook in an interview. [UCMC publishes the quote of Commissioner Hahn translated from Ukrainian]. Why the plan was refused. There are several reasons why the initiative put forward by Lithuanians failed. Firstly, it is not a secret even to Ukrainian officials that Ukraine has the problem with the appropriate use of money. The problems of managing the European assistance funds are real and raise doubts as to the efficiency of the assistance. Secondly, Ukraine is entering the campaigning period already in 2018, and one should expect that the reforms will slow down. The Verkhovna Rada (Ukraine’s Parliament) engaged in pre-election populism, will not be approving harsh and unpopular reforms. During his intervention in Tallinn, Johannes Hahn was particularly stressing on that. “Sorry to say, but the level of trust (to Kyiv’s readiness to hold reforms) is not very high (…),” the European Commissioner said. Thirdly, it is quite unrealistic that the EU is ready to promise serious assistance to Kyiv without knowing who will come to power in 2019. Only after the parliamentary and presidential elections, as well as after the new government is formed, it will make sense to agree on the reforms with the new leadership of the country. Last but not the least, in spring 2019 elections will also take place in the EU, in autumn the composition of the European Commission will change. By that time discussions between Ukraine and the EU on the Marshall Plan will not be very practical. What is the price of liberating political prisoners Umerov and Chyigoz? Liberation. On October 25, Deputy Mejlis heads Ilmi Umerov and Akhtem Chyigoz convicted by the occupational authorities in Crimea were handed over to Turkey. Both prisoners were taken by plane from the Simferopol airport to Anapa, Russia, and then to Ankara. They arrived in Kyiv on October 27. Reasons for liberation. The price of the liberation of two deputy heads of the Mejlis Ilmi Umerov and Akhtem Chyigoz is not being disclosed. The political prisoners claim that they have not requested a pardon. Erdogan’s role. It is obvious that the Turkish President Recep Erdogan played the key role in the liberation of Umerov and Chyigoz. According to the Crimean Tatar leader Refat Chubarov, in Turkey about eight percent of Turks are of the Crimean Tatar origin. Crimean Tatar organizations are active in the country, they skillfully influence the politics. That’s why Erdogan could not ignore this big community. Future plans. Mejlis Head Refat Chubarov said that Umerov and Chyigoz will work and live in Kyiv. The daughter of Umerov Aishe says that the Russian side has not issued the official ban on entry to Crimea to both Umerov and Chyigoz. That’s why they will try to return to Crimea. Being back to Crimea is a matter of principle to both of them. After the annexation, they decided not to leave the peninsula despite the treats and criminal persecution. EU grants Ukraine EUR 90 million for reforms. Ukraine and the European Union signed two cooperation agreements worth of EUR 89,5 million. The European Union will provide Ukraine with EUR 37 million to help government agencies implement the Association Agreement and a free trade area with the EU and EUR 52.5 million to support reforms to develop the rule of law in Ukraine. The first project envisages the financing of a number of procedures for bringing Ukrainian legislation in line with EU law, as well as effective drafting and implementation of reforms. Technical assistance will be focused in such priority areas as public administration, agriculture, land reform, support for the private sector of the economy, health, culture, and transport. As part of the second document signed by the parties, the European Commission will finance the support of judicial reform, in particular, the justice system, the execution of court judgments, improving access to the justice system, state registers, imposing sanctions, as well as supporting reform of the law enforcement system, with an emphasis on the National Police of Ukraine. Slovak reformer Ivan Miklos named the biggest achievement of the energy reform in Ukraine. According to Miklos, it is deregulation of tariffs for energy sources. One of the main reasons behind corruption and inefficiency in the energy sector is the lack of reforms in regulating energy tariffs. Ivan Miklos, economist and former finance minister of Slovakia told it in an interview to the “Business” magazine. According to Miklos, regulated tariffs on energy sources have been long creating a pretext for corruption in the country. According to the Slovak economist, to attract investment to the energy sector Ukraine needs to open the energy market to international competition. 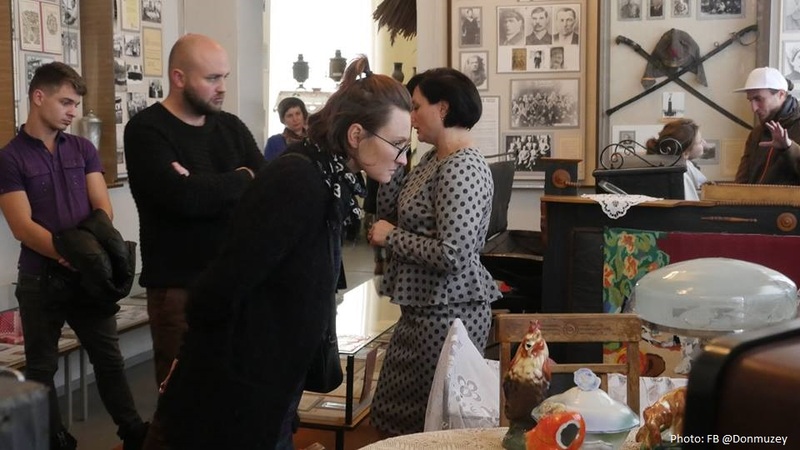 A group of Ukrainian curators and artists started a research expedition through the museums of Donetsk and Luhansk regions. Over three weeks the group will visit 28 museums, most of which are local history museums. Based on the research results a guide to the region’s museums will be published. The group will also choose four museums where curatorial artistic projects will be implemented. The research is part of a new stage of UCMC’s project “Under Construction. Museum Open” that aims at modernizing the museums of Donetsk and Luhansk regions, as well as at enhancing capacities of the museum workers. Follow the route of the research group through the project’s Facebook pages in Donetsk and Luhansk regions. After the unsuccessful performance at the final tournament, Ukraine’s strongest tennis player Elina Svitolina lost a place in the WTA’s top five ranking. 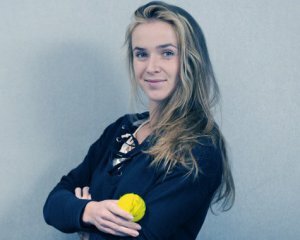 Svitolina will end the season as the world’s sixth best tennis player. The Ukrainian tennis player entered the top 10 after the victory at the Dubai tournament in February, and confirmed her presence in the ranking after her triumph at the Rome tournament.